Pen (A) + Ink (B) + Paper (C) = The Perfect Writing Experience (YAY)! There is no right or wrong answer to this equation since the answer will depend on the preferences and tastes of the writer. I’m still in the process of experimenting with pens, inks and papers to see what works for me. Being a Lefty adds some additional challenges since I’m always trying to avoid a big mess of smeared ink. 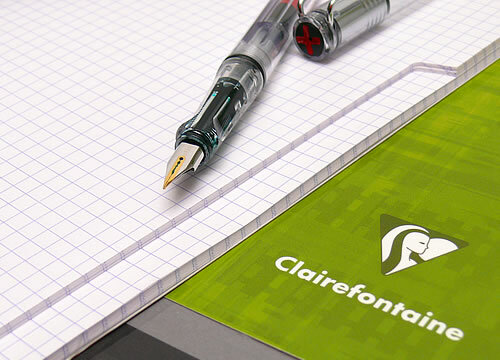 Much to my dismay, I’ve discovered that I am not able to use Clairefontaine’s fabulously smooth 90g white paper for everyday writing with a fountain pen. Almost all fountain pen ink dries too slowly on this paper for my style of left-handed writing and I make a huge mess. *Sniff* However, I can use this paper successfully with a fine nib Platinum Preppy fountain pen using Platinum ink cartridges, Pentel Energel or Slicci gel pens, or some other non-fountain pens and pencils. 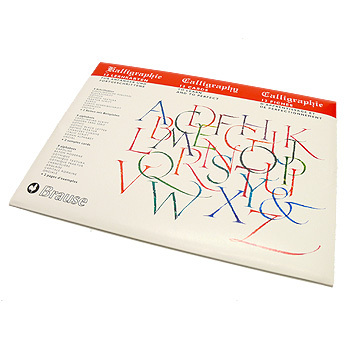 I’m in the process of testing other types of Clairefontaine paper such as the Graf it sketch pads to see if I can use it regularly with fountain pens. It seems that I need a paper that is slightly absorbent and not too coated, that still resists ink feathering and bleed-through. Right now I am loving J. Herbin Ink since it seems to have a pretty decent drying time. As regards to the pen I use, well, is it possible to have too many pens? I tend to write with whatever I’m in the mood for that particular day. This is where I need to hear from you. 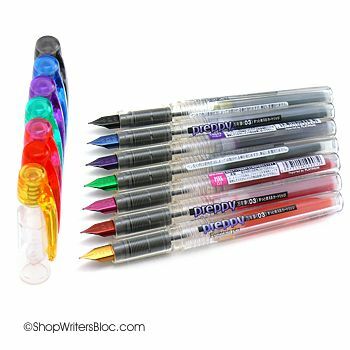 Please leave a comment and tell me what your perfect writing tools are. I’d love to get some valuable tips from other writers! 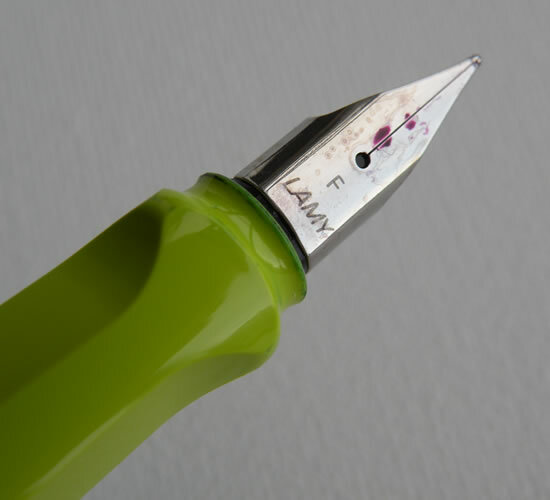 Nib creep is when ink from a fountain pen "creeps" out from between the slit in the nib onto the surface of the nib. 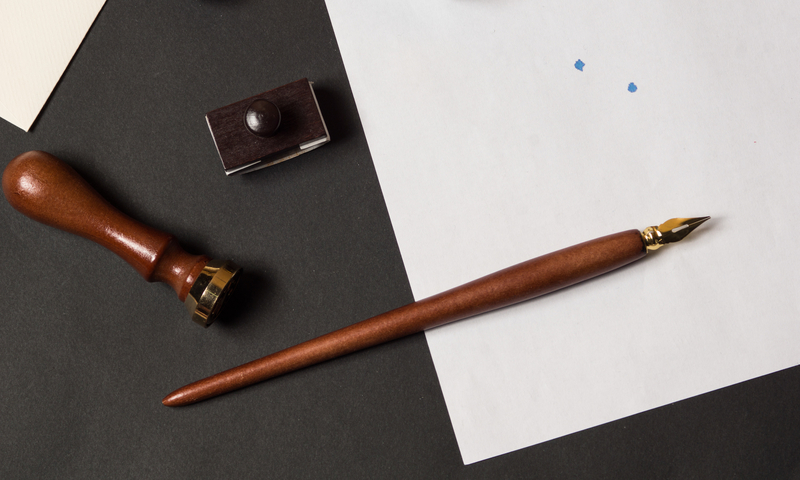 According to the experts on The Fountain Pen Network this can happen due to a few different reasons including the type of ink in the pen, the type of metal the nib is made of or a small imperfection in the slit of the nib can be responsible for drawing ink out on to the nib. 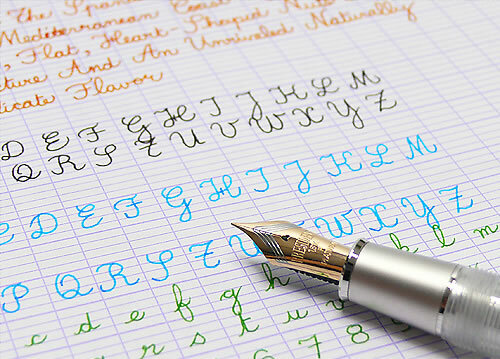 Some people do not like the way it looks or are concerned about staining something with the excess ink, however, a bit of nib creep does not seriously affect the performance of a fountain pen. I have a fountain pen that has some nib creep that seems to happen most during hot weather, but it does not affect the way it writes. For me, I don’t find a little bit of nib creep to be particularly bothersome. 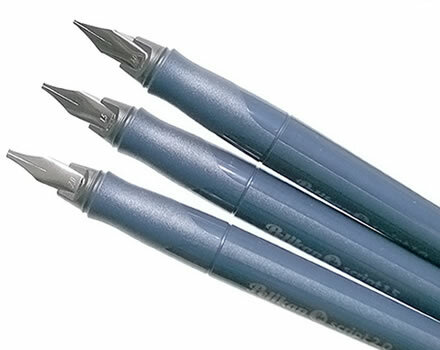 Take the cap off the fountain pen and remove the barrel by unscrewing the pen. Attach the piston converter to the pen if it isn’t attached already. 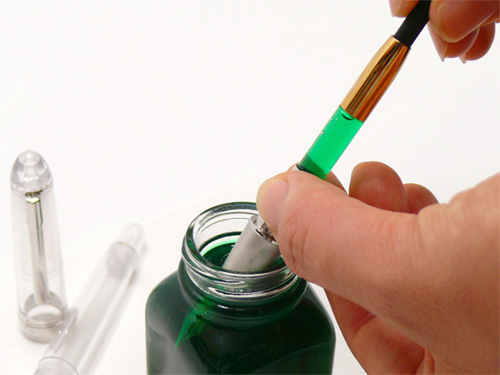 You will need a bottle of fountain pen ink with enough ink in it to completely immerse the nib of the pen. 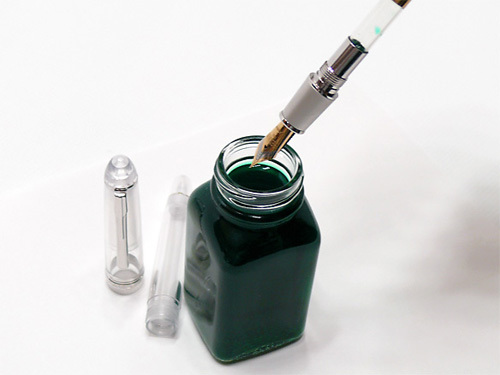 Immerse the nib in the bottle of ink and twist the top of the converter counterclockwise to move the piston down and to force the air out of the converter. Turn the top of the converter clockwise to move the piston in an upwards direction and to begin filling the converter with ink. Be sure that the nib is entirely submerged in the ink! 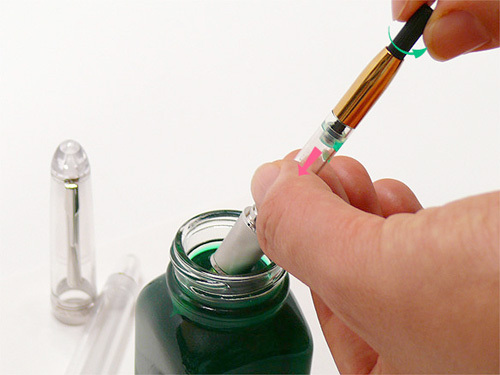 Be patient and wait for a little while before removing the nib from the ink to allow the converter to fill completely. 2) If you think the problem could be dried ink residue and a good soaking in a cleaning solution doesn’t help, taking it to a fountain pen dealer for an ultrasound cleaning may help. 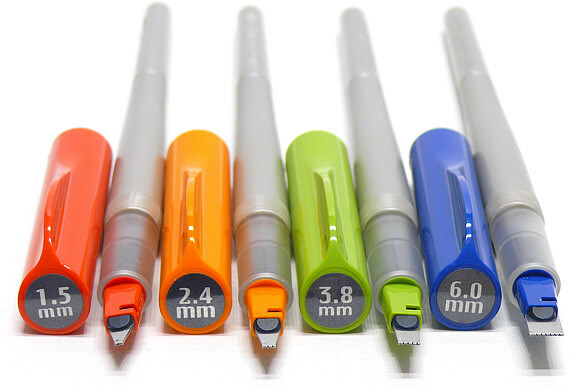 3) Be sure that the ink cartridge is firmly attached to the pen. Once in awhile we find some writers haven’t pushed hard enough to puncture the ink cartridge to start the flow of ink. 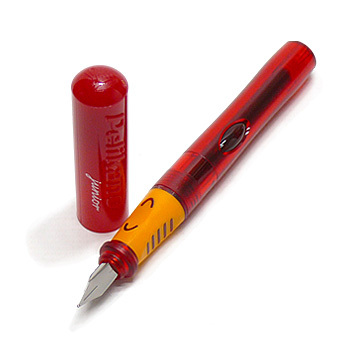 4) Temporarily store the pen with the nib pointing downwards to encourage the feed to fill with ink. Then try it again after waiting for awhile. 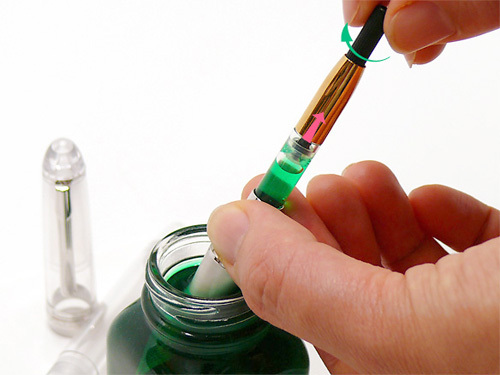 5) Dipping the nib in water for several seconds can also encourage the flow of ink. 6) Add a drop of water to the ink in the cartridge or the converter. Sometimes this helps. 7) Experiment with different types of ink. Noodler’s Ink suggests giving their Eel Ink a try. 8) InkSafe ink additive from Tryphon Enterprises is known to be helpful. 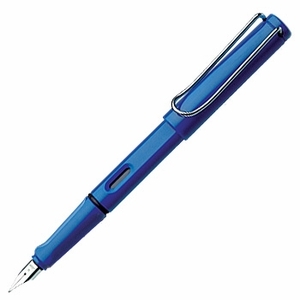 One of its purposes is to improve ink flow in dry-writing pens. We haven’t tried it ourselves yet. 9) If you are using a converter you could try using cartridges or a different brand of converter instead. Sometimes the ink sticks to the sides of the converter and this causes ink flow problems. 10) If the above suggestions do not help, it might be worth it to send your pen in for professional fountain pen repair. Having the nib adjusted (tines realigned, slit widened or narrowed etc) or having the nib replaced could solve the problem. Use caution if trying this yourself because you could damage your pen! We hope this helps. Does anyone else have some tips they would like to share? We welcome your comments!